Sticking to a fitness regimen (a.k.a. commitment) has been proven to be the absolute most challenging thing for people who constantly seek to shape up. It’s the reason why fitness is a multi-billion dollar industry and it’s not about to decrease anytime soon. There are a great number of myths that circulate around the topic of women’s fitness. Here is how the authors of the successful The Body Sculpting Bible for Women, Hugo Rivera and James Villepigue, weigh in on some of the most common myths about exercise and working out for women. Myth #1: Weight training makes women bulky. Due to the fact that women do not produce as much testosterone (the hormone responsible for increasing muscle size) as males do, it is impossible for a woman to gain huge amounts of muscle mass. The image that may come to your mind is of professional female bodybuilders. Many of those women unfortunately use anabolic steroids (synthetic testosterone) along with other drugs in order to achieve that high degree of muscularity. In addition, most also have good genetics that enable them to gain muscle quickly when they spend hours in the gym lifting very heavy weights. Believe us when we say that they do not look like that by accident. Women who conduct weight training without the use of steroids get the firm and fit cellulite-free looking body that you see in most fitness shows these days. Myth #2: Exercise increases your chest size. Women’s breasts are composed mostly of fatty tissue. Therefore, it is impossible to increase their size through weight training. As a matter of fact, if you go below 12 percent body fat (which we do not recommend), your breast size will decrease. Weight training does increase the size of the back, so this misconception probably comes from confusing an increase in back size with an increase in cup size. The only way to increase your breast size is by gaining fat or getting breast implants. Myth #3: Weight training makes you stiff. If you perform all exercises through their full range of motion, flexibility will increase. Exercises like flys, stiff-legged deadlifts, dumbbell presses, and chin-ups stretch the muscles in the bottom range of the movement. Therefore, by performing these exercises correctly, your stretching capabilities will increase. 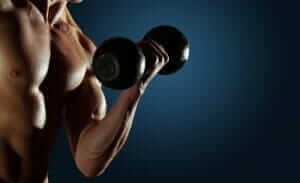 Myth #4: If you stop weight training your muscles turn to fat. This is like saying that gold can turn into brass. Muscle and fat are two totally different types of tissue. What happens many times is that when people decide to go off their weight training programs they start losing muscle due to inactivity (use it or lose it) and they also usually drop the diet as well. Therefore bad eating habits, combined with the fact that metabolism is lower due to inactivity and lower degrees of muscle mass, give the impression that the subject’s muscle is being turned into fat. In reality, what is happening is that muscle is being lost and fat is being accumulated. Myth #5: Weight training turns fat into muscle. More alchemy. This is the equivalent of saying that you can turn any metal into gold. The way a body transformation occurs is by gaining muscle through weight training and losing fat through aerobics simultaneously. Again, muscle and fat are very different types of tissues. We cannot turn one into the other. Myth #6: You can eat anything you want as long as you exercise. How we wish this were true! However, this could not be further from the truth. Our individual metabolism determines how many calories we burn at rest and while we exercise. If we eat more calories than we burn on a consistent basis, our bodies will accumulate these extra calories as fat regardless of the amount that we exercise. This myth may have been created by people with such high metabolic rates (lucky them) that no matter how much they eat or what they eat, they never meet or exceed the amount of calories that they burn in one day. Therefore, their weight either remains stable or goes down. Myth #7: Once you lose motivation, it’s impossible to get back to a healthy routine. It’s true that it’s difficult to get back on track after losing motivation, but it’s not impossible. When you get bored, it’s easier for you to get depressed and your productivity can come to a screeching halt. Your body reacts similarly and stops producing results when you do the same exact activities day in and day out. How do you create results consistently? Change your action plan! In The Body Sculpting Bible for Women we show you exactly how to constantly evolve your training and nutrition plan in order to keep getting results. Myth #8: Exercising makes you tired and exhausts your body. If you’re feeling too tired to exercise, it’s most likely because you’re just bored. Get up and start moving and you’ll be surprised when you feel a surge of energy! Myth #9: You don’t need to work out if you’re already in great shape or if you’re still young. Despite fitness level and age, you can always manage to take care of yourself, and there’s always room for improvement. Think of it as an insurance policy of sorts! Myth #10: There’s not enough time to exercise if you’re working full-time. Even if you’re feeling like your work schedule leaves you with no time to exercise, keep in mind that exercising can actually improve your work performance. Incorporating 30 minutes into your daily schedule for working out will be well worth it as exercise has been proven to elevate mood, which naturally leads to far better results and more productivity in the work place. Myth #11: The gym is intimidating! The gym actually intimidates more people than you think. Even those so-called “gym rats” don’t always feel confident. Any time you’re feeling nervous about being in the gym, remember that you’re in there to do a job and you owe it to yourself to conquer your fears by facing them head on! Motivate yourself by thinking about the fact that you’re doing what most people won’t do or don’t think they have time to do. It’s all about getting in great shape by doing what you gotta do! Myth #12: The gym is crowded, dirty, and it’s just not for me! If you really don’t like the gym, build one in your own home — it’s not as difficult as you would think. All you need is a pair of adjustable dumbbells. This is all the equipment that many of our Body Sculpting Programs require. If you want to get fancier, you can get a weight bench as well. Remember: It’s quality, not quantity that matters. You can still get a great workout with very little equipment. Myth #13: If you’ve failed once, you’re doomed to fail again. The first step in conquering past failures is to stop blaming yourself. Chances are, if you didn’t stick to the plan, it’s likely because the plan just wasn’t right for you. Be sure to set realistic goals and outcomes for yourself and write down your short-term, mid-term, and long-term goals. This will make a world of difference! Our Goal Setting Section in The Body Sculpting Bible for Women addresses this more. Myth #14: You need to give all of your attention to your family, which leaves no time for working out. If you don’t start taking care of yourself, you won’t be able to care for your family and they may even end up having to take care of you! Giving yourself the time to exercise and stay healthy doesn’t mean you’re being selfish. In fact, the healthier you are, the better equipped you will be to care for the people you love. Myth #15: It’s impossible to find the time to work out if you have a baby. Consider bringing your baby with you — many gyms and health clubs now have child-care services. If your gym doesn’t offer this service, find a friend or family member to babysit for an hour or so while you work out. You can make it work if you really want to. Myth #16: You need to stretch before training with weights. Not necessarily. You should not do any static stretching (also known as isometric stretching, in which you hold the stretch for a certain amount of time) before weight training. This actually sends a signal to the muscles that they should relax, which is the last thing you want your muscles doing before a set of exercises. You should instead be using dynamic stretches, which warm and ready the muscles for the upcoming workload by performing active stretches with no holding point. You can also prepare the muscles for the lifting activity by performing the actual weight training movement that you are about to perform, using either light weight or no weight. The Body Sculpting Bible for Women is a comprehensive guide that includes not only exercises but also nutritional tips, psychological tricks, meal charts, workout graphs, different fitness plans, the inside scoop on supplements and vitamins, advice on keeping fit while traveling, and weightlifting information for teens, seniors, and expectant mothers. The 14-Day Body Sculpting Workout for Women has been custom designed by experts to sculpt, slim, and strengthen the unique contours of a woman’s body. The workout never stays the same for long and the results —toned arms, flat abs, tight buns, lean legs, and curves in all the right places—just keep on coming. Reprinted with permission from The Body Sculpting Bible for Women. ISBN: 978-1-57826-438-4, $9.99 (ebook). ISBN: 978-1-57826-401-8, $24.95 (paperback). From Hatherleigh Press. Distributed by Random House.